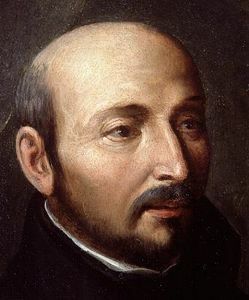 The most pivotal figure of the Roman Catholic Counter Reformation (or, alternately, the Catholic Reformation) was Ignatius of Loyola, the founder of the Jesuit order who established new directions for Catholic education, missions, catechesis, and spiritual formation. Born Iñigo de Loyola, he was the thirteenth child of Spanish nobility. He spent his childhood in Case Torre before becoming a page in the court of Juan Velázquez de Cuéllar at Arévalo in 1506. He moved with Velázquez, who was treasurer general for the Spanish King Ferdinand, to various locations throughout Spain, then left for the house of Antonio Manrique de Lara, duke of Nájera and viceroy of Navarre, in 1516. A year later he joined the military and fought until famously suffering a leg wound in battle on May 20, 1521, when the French took Pamplona. During the extensive recovery, he read numerous devotional works, including Ludolf of Saxony’s Vita Christi and James Voraigne’s Legenda Aurea, resulting in a conversion experience. After returning to health in 1522, he spent a year in penance at a monastery in Montserrat, near Barcelona, where he took instruction and made plenary confession. A year of penance at Manresa followed. The he first read Thomas à Kempis’ Imitation of Christ, a devotional tract representing the spiritual life of the Devotio Moderna movement in the Netherlands and throughout Germany. At Manresa he also recorded much of his time in meditation and that would serve as the basis for his later Spiritual Exercises. He punctuated this period of his life with a pilgrimage to Jerusalem by way of Rome and Venice. One of Ignatius’s earliest convictions was that he could aid other souls in pursuit of salvation through studies. This led him enroll at Barcelona to study Latin and later at Alcalá and Salamanca to study liberal arts and philosophy following his pilgirmage. Due to the growing Spanish Inquisition, he was imprisoned at Alcalá and later at Salamanca on suspicions of being an Alumbrados or Illuminati—a Spanish mystic—but was acquitted. By 1528, he decided to leave for Paris in order to study theology. He took a licentiate in philosophy in either 1533 or 1534, was conferred a master of arts on March 14, 1534, and studied theology for a year and a half, though never taking his doctorate. Like many others in his day, he took the Latinized form of his name, Ignatius, while at school. More formative than his education at Paris was the circle of six he formed around himself, which included the later missionary to Asia, Francis Xavier. The small coterie took vows on August 15, 1534 with the intent of journeying to Jerusalem for missionary work amongst Muslims. Ignatius, along with several others from the group, was ordained in Venice on June 24, 1537. The pivotal moment in the formation of the Jesuits came the following year, when Ignatius approached Pope Paul III for approval of the new order, which had come to name itself the Society of Jesus (Compañía de Jesús). On September 27, 1540, the papal ball Regimini militantis ecclesiae formally recognized the Jesuits and the fledgling order soon named Ignatius its first vicar general, a position he would hold the remainder of his life as he administered the Jesuit affairs from Rome. The work of the Jesuits was diverse. They at first focused their efforts on catechesis and corporal works of mercy, such as building hospitals or providing for the poor. They also sent many missionaries abroad, including Francis Xavier to India and Japan in 1542, others to the Congo in 1548, and others still to Brazil in 1549. Consistent with his earlier commitment to learning, the Jesuits established colleges throughout Europe. Beginning in 1548, Ignatius would oversee the birth of 37 colleges in Italy and Spain alone. He also expanded his educational efforts into German lands, establishing colleges in Ingolstadt and Vienna. By 1550, he saw the primary objective of the Jesuit order as active opposition of the Protestant Reformation and henceforth directed his attention to that end. Ignatius’s most broadly influential work was the Spiritual Exercises. Based on his experiences during the year of penance in Manresa, they were developed further amongst his nascent order in Paris, completed in 1540, and finally printed in 1548. The Exercises were a four-week meditation on the life of Christ intended for spiritual formation. They became the basis for the practice of spiritual retreats and they would remain formative in Jesuit spiritual direction. The writing which had the most direct influence on the Jesuit order, however, was his Constitutions. In contrast with the structural and disciplinary regulations of traditional monastic orders, the Constitutions were concerned chiefly with the spiritual development of the Jesuit. The goal of the work was to map out the spiritual development of each individual in the order from initiation to full profession. Begun in 1541 and ordinarily in response to specific issues that arose under his jurisdiction, it was in collaboration with his secretary Juan Alonso de Polanco in 1547 that the first draft took shape and was printed in 1550. The Jesuits approved it posthumously in 1558. The last years of Ignatius’s life were busied with the affairs of his order. His extensive correspondence reveals the weight of his administrative burden. At death, there were over six-thousand letters attributed to him—the most of anyone recorded in the sixteenth century. Between 1553 and 1555, Erasmus dictated a spiritual biography that has come to be called the Pilgrim’s Report. He details in the narrative the period from his 1521 hospitalization and conversion to his 1538 arrival in Rome, whereupon he would seek and receive official papal approval for the order. He died in 1556, then was later beatified in 1609 and canonized as a saint in 1622 by the Roman Catholic Church.